Last-minute shopping, crowded post offices, trees decorated in hotel lobbies and toys given by Santa to the neediest children of the city; it was a Christmas season very much like today. 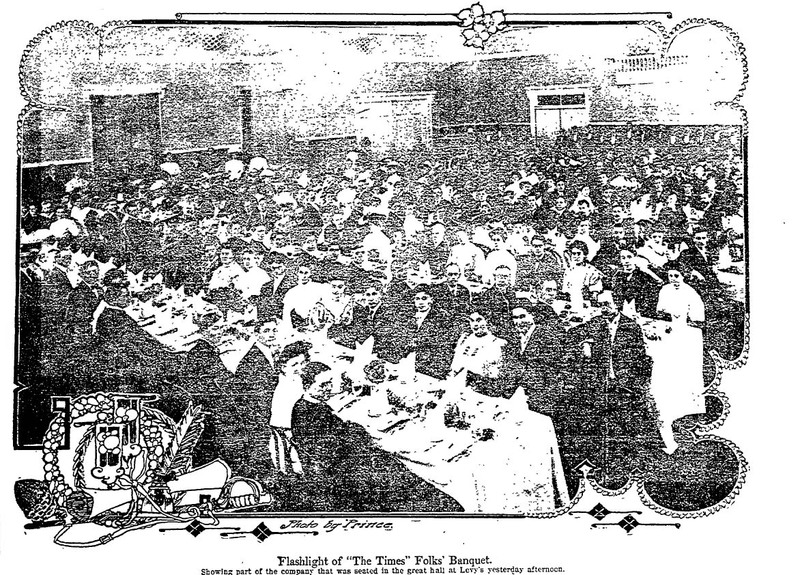 And at Levy’s, 310 Times employees gathered to celebrate the most prosperous year in the newspaper’s history. “Gen. Otis is this afternoon the guest of his official family. He is among his own people—the people who are nearest to him and in whom he is most interested. In his busy and strenuous life he has to do with many men who are great and powerful in the world’s affairs, but it is we who toil within the strong walls of the old gray castle who are his strength and upon whom he relies. His enemies are not here, but are outside of the breastworks, where they lie more or less incapacitated…. 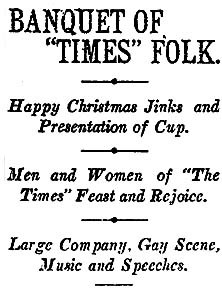 “It is Christmastime and we, the members of the great craft who are each doing our part to produce a great newspaper every day in the year, are here to celebrate. The head of the house sits with us, as one of us and not the least of the hard workers now as he has always been. To him, from his employees and from his fellow workers, from the men and women of The Times, I am commissioned to bear a message of goodwill and loyalty and upright treatment. As a token of these sentiments, I present to Gen. Otis this loving cup, knowing that he will accept it with the same feeling that inspired the givers. “Knowing Gen. Otis as I do, I know that no gift that he has ever received will occupy in his stately home a more honored and more affectionate place than this cup will occupy. “Within his rooftree are many trophies of both war and peace—emblems of hard fights won on the fields of battle as well as in the oftentimes fierce struggles of peace. But when his eyes rest on this cup, which bears to him its message of faithfulness, the loyalty, the esteem and the affection of his own people, there will be no other to stand beside it. This entry was posted in 1907, Black Dahlia, Books and Authors, LAPD, Religion, Streetcars. Bookmark the permalink.